It a good idea to buy the best cordless screwdriver on the market. I mean, who wants the worst electric screwdriver when you’re spending your hard earned money? No one. Hand driving screws and other types of fasteners can take a long time and wear-out your hands before the day is done. Many professions from computer repair to furniture making rely on tools like these because there are just too many fasteners to install on most projects. Cordless drivers are flexible and can easily be carried to a new work space compared to the heavier corded tool. There is no power cord to become tangled or get ruined from sharp edges. They are fairly cheap to use in the long run because there is no power cord to replace or to stop from getting tangled and making a mess. Work goes fast and you can quickly move on to the next project. This frees you up to make more money or spend more time with your loved ones. Before you buy, you need to know about the different types of cordless screwdrivers and what types of features are useful to have. Just like there are different types of drills there are also different types of cordless screwdrivers. Some are suitable for specific types of work while others are capable of multitasking. Before you decide to buy one make sure you know what you’ll be using it for. A powerful cordless screwdriver is the impact driver. They have more torque so there is more power to drive home long fasteners into tough material that would make a light-duty driver stall. Impact screwdrivers are also good for loosening rusty or stuck screws. Their slower speed makes them suitable for use as a screwdriver but you should still be careful you don’t strip heads due to the high torque. Stronger than plain old cordless drivers, the drill and driver tools are capable of both drilling holes and driving home fasteners like a screwdriver does. In order to switch from drill to driver mode you just flip the switch and you’re good to go. When you’re using it as a screwdriver you need to make sure you switch it to driver mode so you don’t accidentally strip the screw or damage the material from driving it in to deep. This is because the high speed of drill mode makes it hard to stop in time. Most of these have only about 4V of max power so they’re only useful for light duty fastening or small spaces. They just don’t have the needed power for hard materials or jobs but are still faster than hand driving a screw. There are certain features that make some cordless screwdrivers better and easier to use than other ones. Many of the better cordless drivers have settings to control the speed. This comes in handy when you’re working with different types of material or different lengths of screws. Changing the torque means changing the rotating speed of the tool. Higher speeds mean less turning power while slower speeds give more power to drive in screws. This is very handy when you’re dealing with hard material, long fasteners or just plain stubborn work. A slower speed and higher torque setting makes it easier to sit fasteners flush to the surface and help prevent accidental stripping. A locking spindle is handy if you want to use the screwdriver manually. It’s sometimes easier to do things by hand so this is a good feature to have. A soft, grippy handle is safe because it makes the tool easy to hold onto and helps to stop your hand and wrist from getting tired. Breeze through home repair tasks with 70 psi and 180 RPM. An LED light and easy to find reverse switch help make most home repair jobs like installing shelves or cabinetry a quick task and easy task. It also has a Magnetic Screw Holder. Stop over-driving and stripping screws simply by using the torque SmartSelect technology and the visually indicating six-position clutch. It’s easier to hold screws or small fasteners in place because the LI4000 is designed with a magnetic tip to keep them where you need them. Working in small or overhead areas won’t be as tiring because the LI4000 has an ergonomically designed grip, measures only 11.2” x 4′ x 10′ in size and weighs only 2.1 pounds. Using the Energy-Star rated battery charger helps save the environment and the 3.6V Lithium-Ion battery holds its charge longer than others; up to 18 months when not in use. The Black and Decker LI4000 comes with the charger, 11 accessories and a warranty of two years. Along with the Energy-Star rated battery charger and 11-piece accessory set, the LI4000 screwdriver is backed by a two-year warranty. Amaze your family with you home repair skills when you use the PD600. Small and hard to reach areas are now simple to work in using the 3-spot pivoting ability and LED light. Your arms and hands won’t tire to quickly either because the PD600 weighs only 2.8 pounds and measures only 12.6″ x 2.3″ x 11.2″. It’s ergonomically designed to be easy to handle in the three pivoting positions, articulating head and locks in place to ensure safety. Use it as a drill at 40 in./lbs on high-speed or a full 80 in./lbs. of torque on low-speed for power while driving in screws. Don’t worry about overdriving screws or stripping heads because the clutch has 23 settings for getting the right amount of power when working with different material. Changing tips is a snap and work goes faster with the quick-release head system and the 6V Nicad battery. Nicad batteries are cheaper than Lithium-ion so it’s easy to charge one while using the other for continuous operation. 80 pounds of torque and 500 RPM from the DW920K-2 provides the power you need for home repairs. The variable speed, reversible trigger and gives you the right control for different jobs such as pre-drilling and driving screws into wood or plastic. An adjustable handle with good grip and two-positions give comfortable control in awkward spots. The industrial strength, quick releasing shank lets you change bits fast along with the electric brake that stops moving parts in just seconds to keep things safe. The DW290K-2 weighs only 3.5 pounds and measures 14.8″ x 11.9″ x 4.6″, being designed for extended use without straining your body. 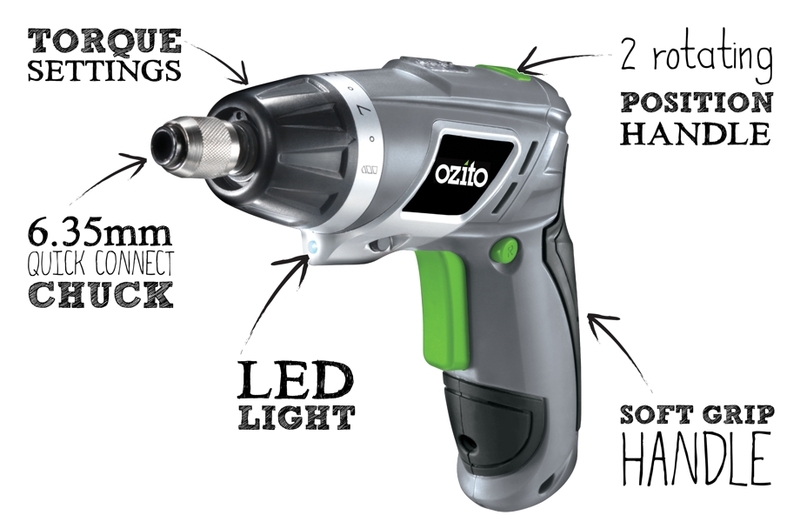 The screwdriver is powered by a 7.2-volt battery pack for extended use. The DEWALT DW920K-2 comes with a one-hour NiCad charger, two small size 7.2V NiCad batteries, a bit for the screwdriver and the kit’s box. 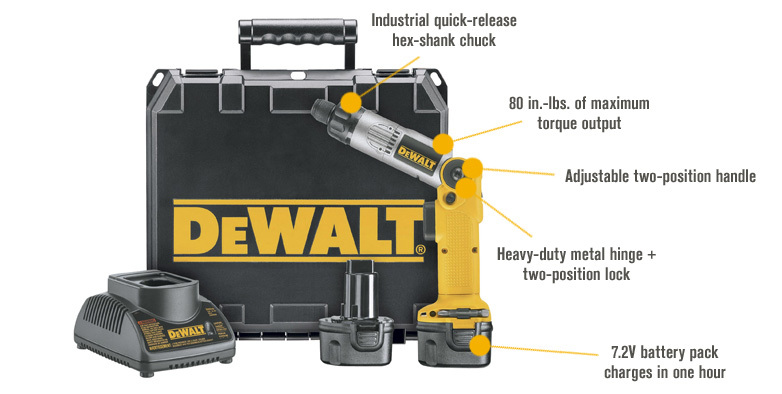 A warranty of 90 days, one-year free tool servicing, and a limited three-year warranty back the Dewalt DW920K-2. The Hitachi DB3DL2 screwdriver gives true and reliable performance for your household repairs and remodeling work. So, 200-600 RPMs provide enough power for the job and the 1.5 amp Lithium-ion battery gives power that doesn’t fade. The Hitachi comes with two batteries so one can charge while the other is working. Dark spaces don’t matter because the screwdriver has an LED light. Pre-drilling and more is possible using the conveniently placed reverse button. Overdriving and stripping is a thing of the past when you take advantage of the clutch and its 21 different settings. The locking spindle makes it possible to hand-drive screws if you need to. You can change tool bits easily with the ¼” hex chuck. Positions that were too hard to reach before are now accessible because the handle has both straight and pistol grip positions. Anybody can use this screwdriver for long periods because it measures only 8.3″x 1.8″ x 5.3″ and weighs only 14.4 ounces. Confident in their products, Hitachi backs the DB3DL2 with a two-year Lithium-ion battery warranty and a Hitachi Lifetime warranty on Lithium-ion tools. Real power for home improvement or hobbies is given by the BDCS80I, impact screwdriver. The 8V Lithium-ion battery provides 2,200RPMs and 125 pounds of torque per inch to drill through or drive into nearly any material around your home. The variable-speed trigger helps you keep the correct speed. When there is opposing torque, an impact system activates to apply rapid rotary pulses that give the tool more torque to power through the resistance. This special torque is nearly 10 times more than other screwdrivers and stops the normal twisting or motor stalls they are victim to. Designed small at 9.4″ x 2.6″ x 7.5″ and lightweight at 2 pounds, it’s easy to drive screws in difficult situations. You can work in dimly lit spaces using the LED light and forget about flashlights or extension cords. The 8V, Lithium-ion battery can hold its charge for one year and six months when it’s not being used. The BDCS80I comes with the charger, a Lithium-ion battery and a 2″ Phillips bit. Take on any job with a durable impact driver that delivers 2,800RPMs and 3,200 impacts per minute. Made for hard to reach and small spaces the impact driver measures only 5.5″ x 9.4″ x 3.9″ and weighing only 2.4 pounds is easy to use without tiring. Working under sinks or inside enclosed places isn’t a problem because the driver has three LED lights to make sure you can see what you’re doing. The ¼” hex chuck can take 1″ bits and is designed for one-handed use to keep work going smoothly. When not in use you can keep your hands free by hanging the driver on the included belt hook. The DCF885 has a specially designed switch that helps prevent the tool and battery from becoming damaged due to overloading, overheating or deep discharges. Power is provided by a 20V Lithium-ion battery so you can be sure you’ll have charge when you need it. The DEWALT DCF885 Impact Driver comes with the Belt hook but you need to buy the battery yourself. There is also a three-year limited warranty, a one-year contract for free service and you have 90 days to return it for your money back. The 2354-02 iXO has enough power to do the job but is small enough to go anywhere. The 4V of power provides 200RPMs that result in a high amount of torque to make driving home screws easier than a tool with higher speeds. The slower speed helps you stop overdriving or stripping the screws head. The best cordless screwdriver is made to be safe and easy to use with a thoughtfully placed reverse control and trigger lock above the trigger. Drilling direction is shown by top-placed LED indicators. Comfort and control are aided by the rubberized handle. Its small measuring only 2.8″ x 10.3″ x 8.2″ and weighing only 2.1 pounds so it’s small enough for anybody. Dim lighting conditions are no problem because the LED SiteLight shines when the trigger is pulled. Don’t worry about small spaces and difficult angles because the right angle attachment goes on easily in the direction you want it. The bit holder is magnetic to help hold things in place and it’s possible to use any ¼” hex type of bit. Safely forget about the screwdriver when you’re not using it because the Lithium-ion battery holds its charge for one and a half years. The Skil 2354-02 iXO comes with a set of five bits and the battery charger. You have 30 days to return the tool for your money back and you get a one-year warranty. 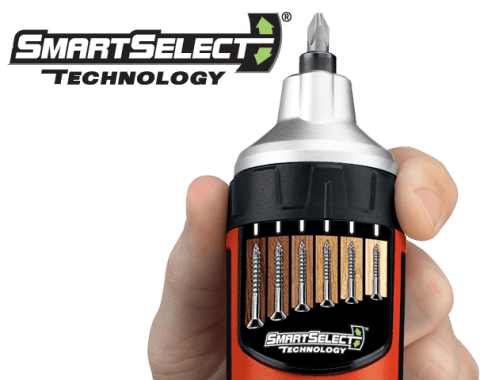 What do you think about the top cordless electric screwdrivers? These are perfect examples of tools that have the right features to make the best cordless screwdrivers. As you can see many have LED lights to help in dark spots so you don’t need to use an external light source. They are also lightweight to help stop fatigue and wear and tear on your body. They tend to have adjustable handles or heads so you can reach awkward places easier than you could without them. Take note of the types of things you’ll be doing with the tool because doing this will ensure you can buy the best cordless screwdriver for the money.